This blog article is going to carry on from a certain point I made about the underworld in my last blog entry, called Summer's End. But, before I start, I would just like to say that my ideas I present here are not just theoretical musings! They are an accumulating data of knowledge that I have specifically asked the spirits I have worked with to help me understand. 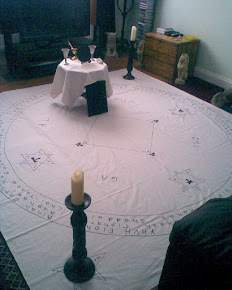 The spirits I have worked with in order to gain a knowledge of the Mysteries and an understanding of particular systems of magic, range from the Egyptian neteru and the Greek deities, to the spirits of the medieval and Renaissance grimoires. Such as; the Heptameron, Ars Goetia and Rudd's Nine Angelic Hierarchies. Now it is all good and well for me to say that the information I am giving forth here on my blog is based upon received gnosis from actual magical work with specific beings. But, unless it can be backed up through research and evidence, it basically means diddly-squat! This is where many go wrong in their magical works because they are all to keen to trust what the so called spirits have said to them, often to the total neglect of academic research. When the magician is on the right track, being properly guided by the beings he/she chooses to work with and not by fictitious phantasms of their own creative imaginations, then he/she will find the evidence through research to back up their magical experiences. It is with this in mind that I share with you the realisations I have come to understand and find out about the underworld and it's inhabitants. Looking at the creation myths in the ancient writings it often shows that they are consistent on dividing two realms of being; heaven and earth, sky and sea, or spirit and matter. Each representing an upper and a lower realm of being. The upper realm is considered to be divine, and is known as the celestial world, while the lower world is the material plane that is also called the sub-lunar world because it resides underneath the moon, which we naturally see when we look up from the earth. Therefore, the underworld can refer to nowhere else but the physical level of here and now, where we presently live and experience our everyday lives. Even though it is known as the underworld it is not underneath the earth as most people often surmise. This is because it is the level of reality that is underneath the spiritual world which is classed as being up there, in regards to the natural world which is down here. This can be seen by the context in which the word “life” is used in the ancient writings, where it always equates its meaning to spiritual consciousness. As is often shown in the Bible: “he that believeth not the Son shall not see life” (John 3:36). And in Job 7:7. “O remember that my life is wind ”. Here wind is used as a symbol to represent life as something that is spiritual because the word spiritual pertains to wind, breath and air. According to the writings of Pietschmann, the Egyptian god Thoth was perceived as the god who gave life in the land of the living and; “The Land of the Living was the Invisible World, a glorious Land of Light and Life for the seers of ancient Egypt” (G.R.S. Mead,1906, p,51). In the writings of Plutarch: Concerning the Mysteries of Isis and Osiris, he says; “Moreover, we hear Homer also on every occasion calling the good variously “godlike” and “equal to gods”, and as “having directions from gods”” (Ibid, p, 299). There are plenty more examples in the Bible too, but to finish of this part of the article an appropriate one is; “For to be carnally minded is death : but to be spiritually minded is life and peace” Romans 8:6. Now that we have ascertained that the proper location of the underworld is where we live out our earthly lives, lets take a look at some of its more well known inhabitants. 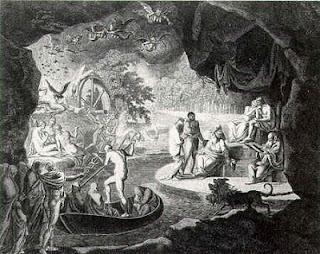 The first inhabitant of the underworld I am going to discuss is the one who is associated with the soul's entrance into Hades, this is the ferryman called Charon. He is the son of Nyx (night) and Erebus (darkness) who is said to ferry the newly dead across the marshes of the river Styx, or the river Acheron, also known as the river of hate and the river of woe. 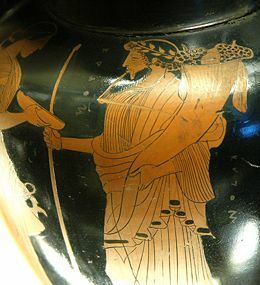 He holds a pole in his right hand leaving his left hand free to receive the dead from Hermes. In order for the dead to cross over into Hades, a payment of a low valued coin called an obel has to be made to the ferryman. According to Virgil (Aeneid. Bk VI. 299) only those who had received a proper burial were allowed aboard Charon's vessel, while the unburied were left to wonder the shores for 100 years like ghosts. To enable us to understand the esoteric meaning of Charon's myth, we must keep in mind the allegorical meaning of death, as the ancients used it. That is, it refers to the death of the divine part of the soul as it is plunged into the sea of matter, not the death of the physical body! Once this is grasped, a whole new light of understanding should enable us to interpret the myths associated to the underworld with much more clarity of thought. Charon is ferrying the souls of the newly dead who are literally the living, therefore he cannot be taking them to the hereafter, so instead the only logical explanation is that he must be taking the souls to physical matter to incarnate! Here is the answer as to why he will not take those who have not received a proper burial. This is because “burial” in the ancient symbolic writings is the metaphor for the soul being placed in to the body. Just as Plato suggests that the grave is the body which the soul is confined (buried) within. And therefore it is common sense to say Charon cannot take the souls who do not have a body to gain entry into Hades (physical life) with. What about the low valued coin you may well ask. It is obviously symbolic because money is used to acquire material things, and therefore has no use in the realm before life, or even after life. The act of giving away the thing that enables one to purchase material desires with, must therefore be a purely symbolic gesture that betokens a sacrifice of the lower desires in order to progress and spiritually develop through the material level. As now can easily be seen, the ancients who created these myths, did so out of common sense with purpose and meaning, and not out of superstition of some long forgotten ancient rite. As many would have us believe. Another Greek spirit associated with the underworld is Thanatos, also being a son of Nyx and a brother to Hypnos (sleep). “In Roman sculptural reliefs he was portrayed as a youth holding a down turned torch and a wreath or butterfly symbolizing the soul of the dead ” (http://www.theoi.com/Daimon/Thanatos.html). The symbol of the butterfly is most interesting because the word for soul (which it symbolizes) in many languages means life, consciousness or spirit. The torch that has been turned upside down must signify the light of spirit from above, which has been placed in to the underworld of our earthly existence. Another interesting image depicting Thanatos is given by Pausanias in the c2nd A.D. where he describes Thanatos as an infant child being held with his brother Hypnos in each arm of their mother Nyx (IBID). The intriguing point of this description is that each child is said to have their feet turned in different ways. I would think this means that death brings the soul downwards through the last phase of the journey of involution towards life on the physical plane. While through the sleeping state (as certain Greek philosophers describe people to be in) the soul starts the walk of evolution in the opposite direction upwards, towards the divine spiritual state of being. "Talk all you will, you get no more of me! The woman shall go down to the dwelling of Hades. Now must I go to consecrate her for the sacrifice with this sword; for when once this blade has shorn the victim's hair, then he is sacred to the Lower Gods ” (Euripeds nd). The shaving of hair is seen as a sign of contrition as the soul becomes subject to the natural law of sin for being born into the lower carnal nature of the body. In the ancient Egyptian mysteries Isis is said to have cut off a lock of her hair and put on a morning robe when she heard of the death of her husband, Osiris (Plutarch). This is explained by Isis representing the force that is seen as the wisdom of the spiritual nature. She laments for the death of the divine part of the soul (the god Osiris) which has to naturally die in order for the soul to incarnate into matter. This is because divinity is achieved through the spiritual evolutionary development in life on the physical plane of matter, the names of which from different cultures include; Amenta, Sheol, the Underworld, Hell and Hades, which actually means 'that which cannot be seen.' This is because the divine part of the soul cannot be seen on the material level. That is until its awakening through some type of spiritual development process, such as ceremonial magic. The next god that we shall take a look at is Hades. The son of Cronus (time) and Rhea (space). Also known as god of the dead. Now considering we now realise that “the dead” is a metaphorical statement that the ancients used to refer to everyday people living lives on the material plane, it will therefore go to show that Hades is in fact the god of the living. When seeing him in this light, all of his attributes start to make a lot more sense, as we shall now see. First of all he is said to own the helm of darkness or cap of invisibility. This was given him by the Cyclopes and on occasions it would be borrowed by other gods and heroes, such as Perseus, who received it from the water nymphs. The obvious reason for Hades possessing this helmet of invisibility, would be for it to symbolise the fact that he represents the hidden god in nature, or life on earth. During life in the lower nature of the body and mind on the physical level, the divine nature of the soul is generally kept hidden away from us by the earthly temptations and desires of the flesh that occupy the thoughts of our minds. Hence the invisibility symbol being a helmet which covers the head, just like the material thoughts and desires which hide the doorway to the divine state within our own minds. Hades was also called Pluto, giver of wealth and riches. Now this title could quite easily have a double meaning, for no where else but on the material level of life are wealth and riches experienced. It is also because of such lusts and desires for material riches that can also be a contribution to the cause that keeps the spiritual nature of the soul hidden and kept from being discovered. But, when this title is interpreted from a spiritual perspective, it's meaning can be given a different twist, which represents the wealth and riches of divinity that lay hidden deep within the soul awaiting discovery. It was also said that Pluto holds a key: “ As to the key they say that what is called Hades has been locked up by Pluto and nobody will return back again there from. ” ( Pausanias. 5.20.3 Votive offerings in the temple of Hera). “ I am he who lives, and was dead, and behold, I am alive forever more. Amen. And I have the keys of Hades and of death ” (N.T. Revelation 1:18). The wife of Hades is Persephone, whose mother is Demeter the Earth Mother, or more precisely, Grain Mother. Also called by the Romans, Ceres. “All such figures - heavenly manna, bread, wheat, ambrosia, nectar, meat, corn, wine, honey, barley – are forms of typology suggestive of the deific life ordered to mortals for their immortal nutrient. The body of spiritual intellect, Ceres, which was true 'cereal' food for man was crushed into bits and then welded into a cake so that it might be 'eaten' by mortals ” (A . B . Kuhn, nd, p. 212 ). “The philosopher Isocrates thus bears testimony “She (Demeter) gave us two gifts that are the most excellent; fruits that we might not live like beasts; and that initiation, those who have part in which have sweeter hope, both as regards the close of life and for all eternity. ” (T.Taylor, 1891, p 19). This implies that unless the soul partakes of the divine fruit, then it will remain to live like an animal, dead to the higher divine nature. It is no wonder then that the Athenians were said to of called the dead “Demeter's people (demetrioi)" (Y. Bonnefoy. 1992, p. 155). This is because it is us in our deadened state while on the earth, who are to receive the divine nourishment from the Goddess to enable our spiritual development to take place. The myth related to Demeter's daughter, Persephone, who is taken by Hades to the Underworld is suggestive of the demise of life in the dark half of the year, when nature seems lifeless and barren only to return again in the spring, when sprouting leaves and buds on the trees and the shoots of flowers in the fields portend Persephone's return to the upper world. But, as always with mythology the initiated interpretation remains veiled behind the outward general meaning, and in this case the myth of Persephone's abduction, is nothing but a clear indication of the descent of the soul to the lower world, where the soul becomes wedded to the lower nature, and lives in the darkness of life until it awakens to it's spiritual life. This awakening is symbolised by the spring time in the light half of the year when the sun starts to increase in light, which signifies the soul coming forth into the light of day, its divine spiritual nature. And here we have a perfect example of nature demonstrating for us, the outward objective manifestation of the inner spiritual transformation that can happen to the human soul. Nature is but a mirror that the magician peers into, to see the truth of inner spiritual reality reflected. As above so below. Dionysius, 1965, Mystical Theology and the Celestial Hierarchies, 2nd ed. Surrey. The Shrine Of Wisdom. G.R.S. Mead, 1906, Thrice-Greatest Hermes, Studies In Hellenistic Theosophy And Gnosis, Forgotten Books. J, M, Cooper, 1997, Plato Complete works, 1st ed, U.S.A. Hackett Publishing Company, Inc.
A.B. Kuhn, nd, Lost Light An Interpretation of Ancient Scriptures, Filiquarian Publishing, LLC. T. Taylor, 1891, The Eleusinian and Bacchic Mysteries, New York, Blibliolife. Y. Bonnefoy. 1992, Greek and Egyptian Mythologies, U.S.A. The University of Chicago Press.